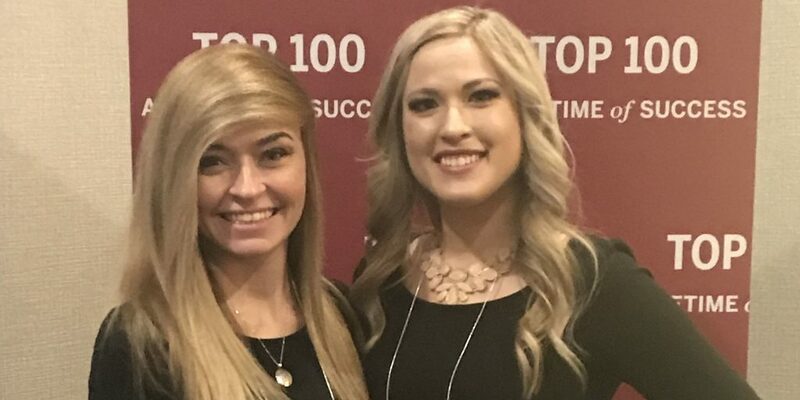 Two students from the IU School of Informatics and Computing, senior Jordan Nelsen, Media Arts and Science (MAS), and junior Rachel Palfi, Health Information Management (HIM), were recently recognized at the 2018 Top 100 Outstanding Students Recognition Dinner. Nelsen was also selected for the top 10 list. The IUPUI top 100 and top 10 students are chosen by a panel of alumni, faculty and staff based on their record of scholastic achievement, campus co-curricular activities, and civic and community service. Nominees must be juniors or seniors who have completed at least 56 hours toward a degree, with a minimum cumulative GPA of 3.2. Nelsen, who also completed her B.F.A. from Herron School of Art and Design, is heavily involved in facial prosthetic reconstruction research. She learned of the opportunity through an MAS class in 3-D design. “I have always been extremely interested in both anatomy and art. Finding this niche that satisfies both of these interests while also being able to directly help people has been a dream come true,” Nelsen said. For nearly the past two years, she has been collaborating with Dr. Travis Bellicchi, a resident at the IU School of Dentistry, to create facial prostheses for patients who have lost facial features due to cancer, accidents, or burns, or have lived without certain features because of congenital disorders. In that time, she has been a part of 16 patient cases, most recently digitally designing a prosthesis in less than 4 hours, which led to the team being able to fit the prosthesis on the patient and characterize it in an unprecedented delivery time of less than 24 hours. Nelsen has also worked with esteemed neurosurgeon Dr. Aaron Cohen-Gadol as an artist completing 3-D medical visualizations for the Neurosurgical Atlas, the most trusted neurosurgery resource in the world. And she is using her skills to design surgical guides for dental implants, research better processes for creating more accurate and effective burn masks that minimize patient discomfort, and develop a pipeline for forensic facial reconstruction from unidentified human remains. Aside from her classes at IUPUI, Nelsen has been involved with SIGGRAPH IUPUI Student Chapter, a media arts club, serving as marketing director, vice president, and president. Palfi, who is a Cox Scholar, is involved in multiple organizations on campus—Order of Omega Greek Honor Society, Golden Key International Honor Society, Delta Zeta Sorority, and Jagathon—and participates in the IUPUI Day of Service, Martin Luther King Jr. Day of Service, Cesar Chavez Day of Service, and Jaguars in the Streets. She also volunteers her time at Second Helpings, Ronald McDonald House, Riley Hospital for Children, Keep Indianapolis Beautiful, Walk to End Alzheimer’s, Coxhall Gardens, and 500 Festival events, among others. In addition to her co-curricular activities at IUPUI, Palfi holds two jobs on campus. “I love giving back to my community and helping others,” she said. Both women acknowledge the valuable guidance of faculty who mentored them throughout their academic careers. “Zeb Wood has been one of the greatest mentors I could have ever asked for. He has taught me so much and has continued to motivate me to push myself to heights I never thought possible. The work that I have been able to accomplish would not be possible without him,” Nelsen said. Palfi identified professors Lisa DesNoyers and Carolyn Murry as having had a significant influence on her at the School of Informatics and Computing. “They are always there for me when I need them, and I know they both want me to succeed. Both of these women have helped me grow professionally, academically, and as a woman in the health information management field,” she said. Nelsen’s plans post-graduation are to continue to serve the facial disfigurement community by creating facial prostheses and further the research she has already started, while simultaneously balancing her digital illustration and painting work. Palfi is looking to stay in Indianapolis and work at a healthcare organization. Although she is not sure about the specific position she would like to have yet, she is very interested in working in data analysis, informatics, and healthcare technology.